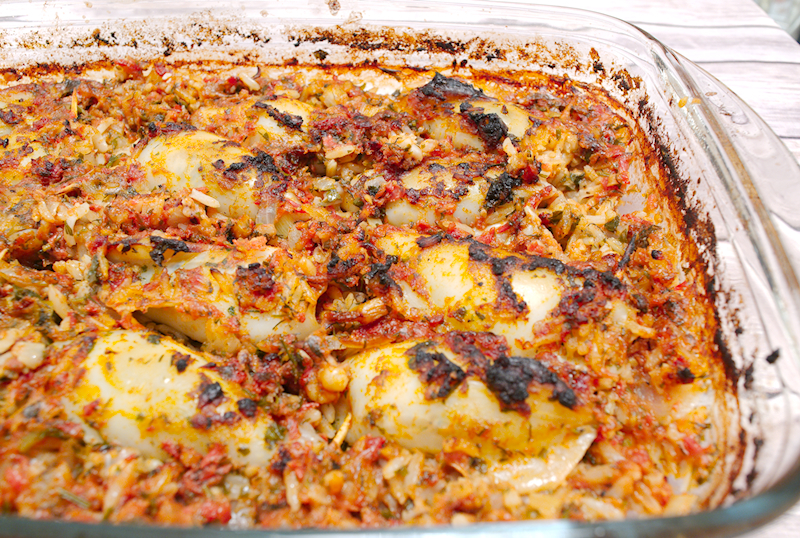 A lovely recipe for stuffed squid with rice and herbs in tomato sauce. Very popular in Greece as “Kalamaria Gemista”. Calamari, together with cuttlefish and octopus, is my favorite seafood. There many ways to enjoy them. When they are small I like them fried, especially when they are fresh. Sometimes you can find a big calamari and grill it. Topped with olive oil and lemon takes you to heaven. Squids come from the same family as calamari but…they are cheaper and a bit harder. It’s not easy to find the real calamari where I live so one has to do some sacrifices. In other words, I fooled myself with some squid. 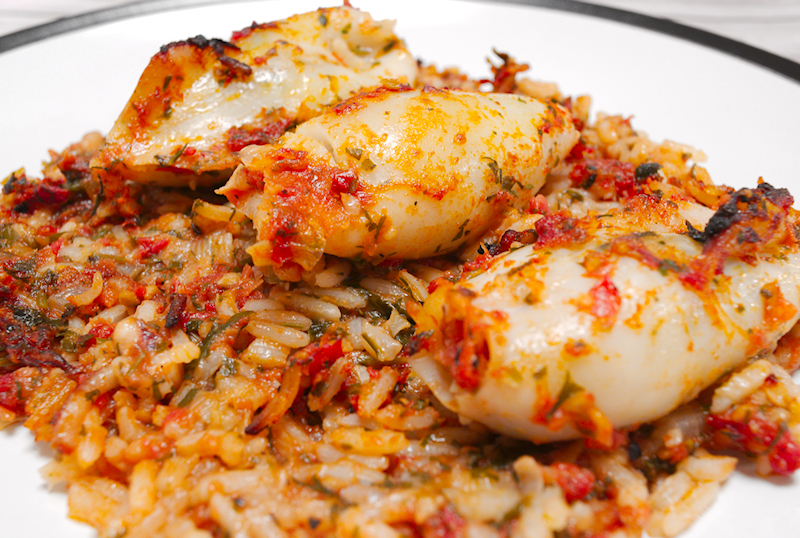 Stuffed squid is becoming quite popular in Greece lately. 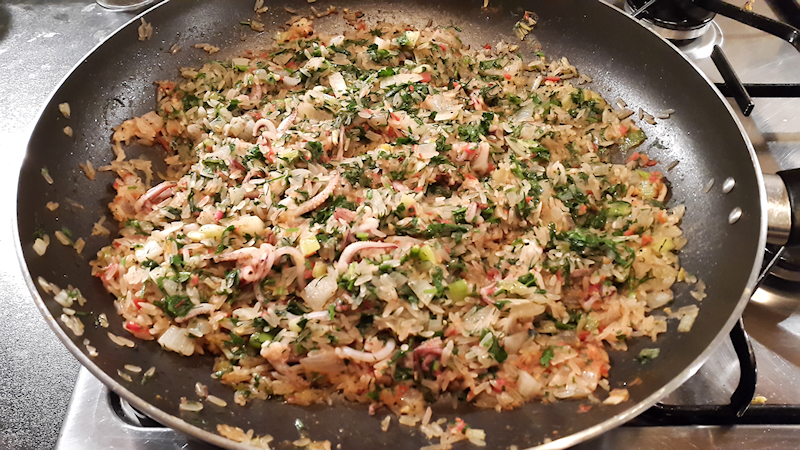 The common stuffing is rice and herbs. 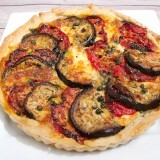 However, people also use spinach and sometimes mince meat. I followed the first and simple version this time. 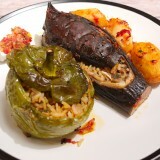 This is a hearty dish that can feed many people so do not hesitate to make it for a small family gathering. The squids I found were quite small so I used 12 of them for ~ 4 portions. If you find larger ones, I believe one or two of them are enough for one person. 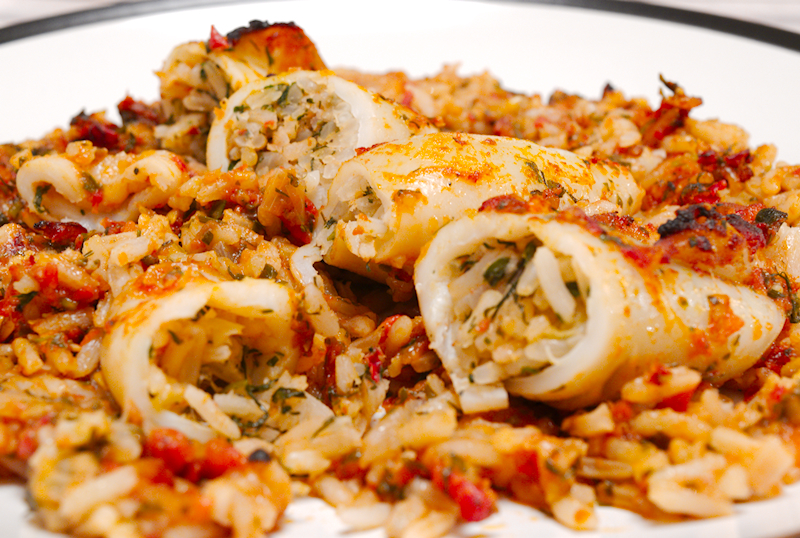 Cooked in the oven, the stuffed squid tenderize and get the flavors and aromas from the herbs and tomatoes. If you are only familiar with the fried calamari they serve in restaurants you will be amazed of how delicious are these little creatures when they are slowly-cooked in a sauce. Yummy! A lovely recipe for stuffed squids with rice and herbs in tomato sauce. Very popular in Greece as “Kalamaria Gemista”. ½ cup of long grain rice. 1 large onion finely chopped. 5-6 spring onions finely chopped. A big bunch of flat-leaf parsley. A small bunch of fresh dill. 3-4 sweet and ripe tomatoes. ½ cup of tomato Passata. 1 cup of white wine. Clean and wash the squids. If they come with their tentacles, chop them and set apart. 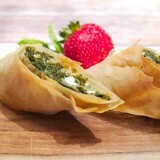 Add the fresh tomatoes, half of the parsley and garlic in a food blender and make a smooth paste. Add half of the olive oil in a large frying pan on medium heat. Add the onion, spring onion and the chopped tentacles (if any) and cook for 3-4 minutes until they start to soften. Stir occasionally. Add the rice, give it a good stir and cook for a minute or so. Add ½ cup of the wine, give it a good stir and let the alcohol evaporate. Chop finely the dill and the rest of the parsley. Add half of the tomato paste from the blender, half of the passata, the rest of the parsley and dill and season with salt and pepper. Let it cook for 2-3 minutes and remove from the heat. Use a teaspoon and fill one squid with the mixture from the pan. You should not fill it completely as the rice will expand during cooking. 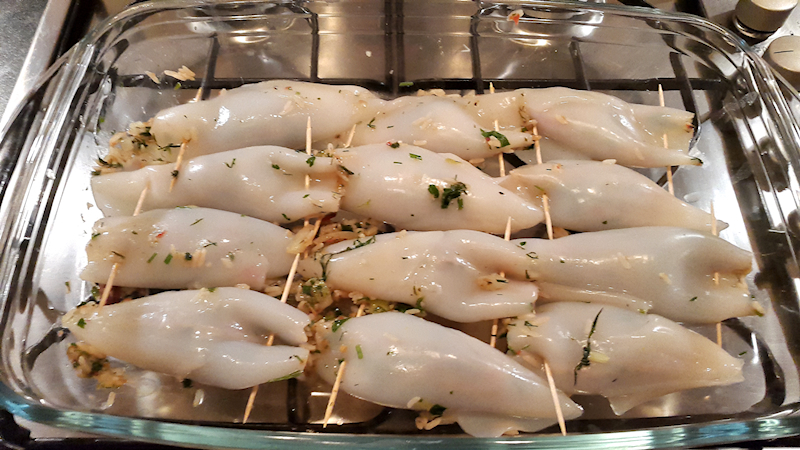 Use a toothpick to seal the opening of the squid so that the stuffing will not come out during the cooking process. 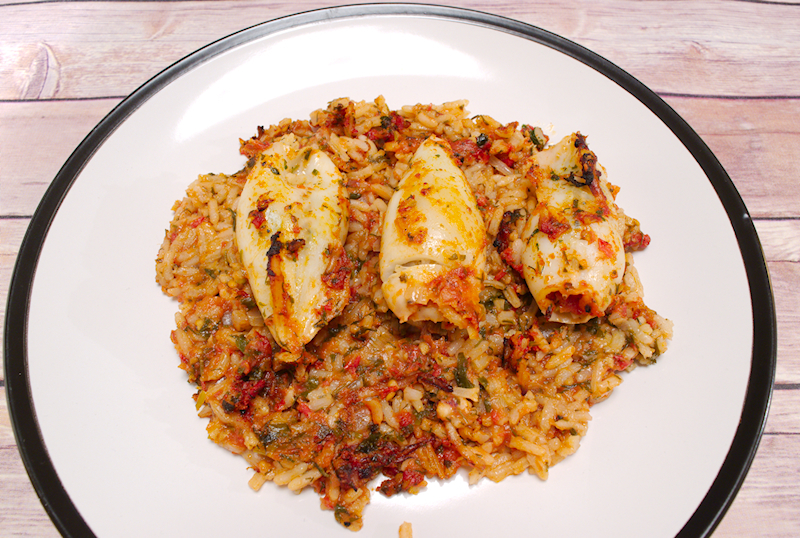 Place the stuffed squid on a medium-large pan and repeat for the others. Add the remaining stuffing from the pan to the tray and season with salt and pepper. 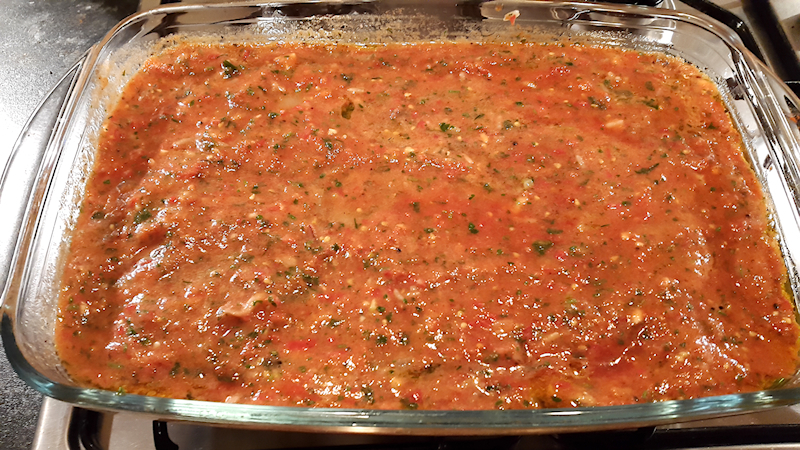 Pour in the rest of the tomato sauce, Passata, white wine and hot water so the squids are almost covered. Cover the tray and let it cook for ~ 40 minutes in the oven. Uncover the tray and let it cook for another ~ 20 minutes until the squids start getting brown.